Blue Note issued around 350 titles on 12″LP from 1956 until 1966, when the company was sold to Liberty Records Inc. The last catalogue number allocated by Blue Note was BLP 4250 Horace Silver The Jody Grind, and beyond there, all future release decisions were made by Liberty. At the time of the sale of Blue Note, however, there were thirty five titles in preparation for release. The full list is shown below. These sessions had been recorded by Van Gelder, and the tape mastered by Van Gelder – Van Gelder metal existed – a Blue Note catalogue number had been allocated, and many if not all had sets of labels with the New York address ready. Possibly covers were already manufactured, or at least a Reid Miles design commissioned, but the record had not yet physically been pressed. All these assets transferred with the sale to Liberty, who pressed the records mainly during the last half of 1966. 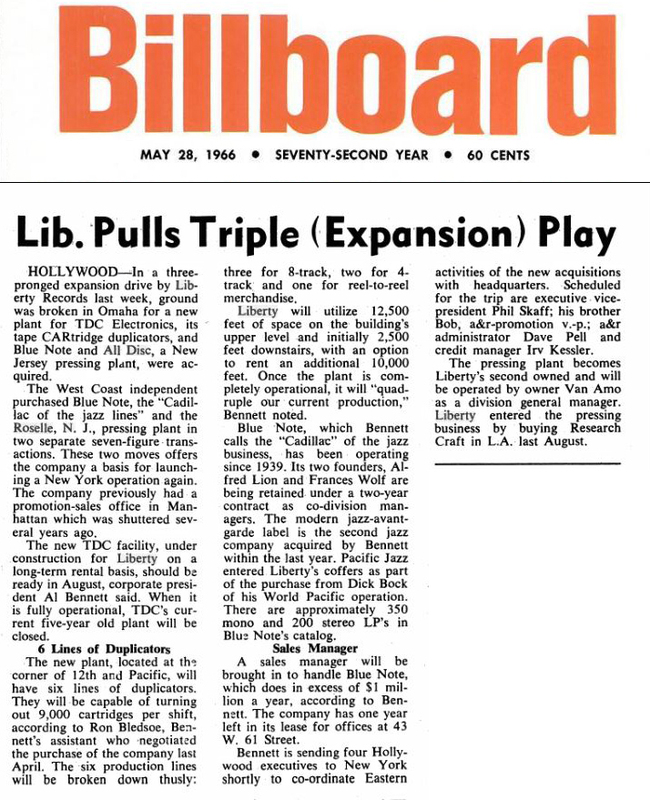 None have the Plastylite ear because pressing transferred immediately to the plant that Liberty purchased to complement their expansion plans: All-Disc, Roselle N.J. While the Van Gelder stamp appeared on the master, the ear was applied during pressing in the Plastylite plant: when pressing moved, the ear disappeared. All-Disc was, to all intents and purposes, an equal of Plastylite in terms of pressing quality, though their pressings are lighter than Plastylite – an average of 147 grams for those pressed with old stock NY labels, compared with Plastylite’s average 166 grams (1962-66) . Liberty Blue Note titles are found with and without a Van Gelder’s stamp, most often absent on West Coast pressings by Research Craft, who re-mastered the recordings for themselves, and generally present on All-Disc and other East Coast plant pressings. Though the absence of ear is considered a negative for selling prices, it is the reassuring presence of a VAN GELDER stamp that matters most as regards sound quality. In addition to the first release of those thirty five titles in preparation, Liberty also reissued many popular titles from the back-catalogue of Blue Note. In both cases, any labels found in the inventory were used first before printing more. This included not only previously prepared NY labels, but any available labels, going as far back as the 767 Lexington for titles released in 1956-7. Labels printed before 1961 lacked the legal ® trademark protection and incorporation references, so in matching Side 1 and Side 2 pairs, the older label was often matched with a more recent label on the other side, hence it is not uncommon to find mixed pairs of Blue Note addresses. Though an original Blue Note NY label is considered somehow “original” compared with the “later” Division of Liberty label, there may be no practical difference between a Liberty copy with an NY label and one with Division of Liberty label, both pressed by All-Disc for Liberty at around the same time. The thirty five previously unreleased titles are a special case: Blue Note recordings whose first “original” pressing was by Liberty, no copies with ear exist. One added complication collectors should be aware of: some titles were released by Blue Note only in mono (with ear). Liberty went on to issue the first stereo edition (without ear). A Liberty stereo for those titles is technically a first pressing. The full list of the thirty five titles includes some surprises, with much lower catalogue numbers, whose release had been deferred by Alfred Lion for several years, for commercial reasons. Both MONO and STEREO first pressed by Liberty; no copies with Plastylite ear exist. In addition to the above first stereo release by Liberty , there are a further twenty four Blue Note titles whose first stereo release was in Japan by King Records or Toshiba-EMI. Whilst King did sometimes remain faithful to the mono format, but not always, and Toshiba tended to issue only a stereo. There are also a number of titles only ever released in Japan. Early Blue Notes recordings made in the late ’50s are not especially recommended in stereo, as they were cut from Van Gelder two-track tapes that were intended to prepare a mono master. As the home ownership of stereo phonographs increased, from around 1959, a number early Blue Note mono recordings went on to be issued in pseudo-stereo – “electronically reprocessed for stereo” so new stereo record player owners could enjoy them in simulated “stereo”. Whilst these can be “original Blue Note” issues, they are not true stereo as they pre-date Van Gelder’s move to two track tape recording. These can also be found in pseudo-stereo among Liberty “stereo” reissues. Towards the end of the 1500 series, Van Gelder was routinely employing two track tape, so “genuine” stereo could be recreated at a later date.